The PSNI, politics and the border (surprise, surprise) are the hot topics on Tuesday's front pages. 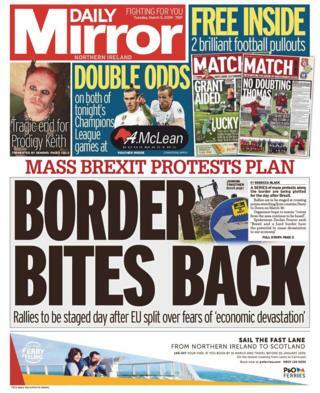 The Daily Mirror leads with the headline 'Border bites back'. The newspaper reports that a series of protests along the Irish border are being plotted for 30 March, the day after Brexit. Organisers hope to ensure "voices from the area continue to be heard". And the border also makes the front page of the News Letter, this time with an interview with DUP deputy leader Nigel Dodds. 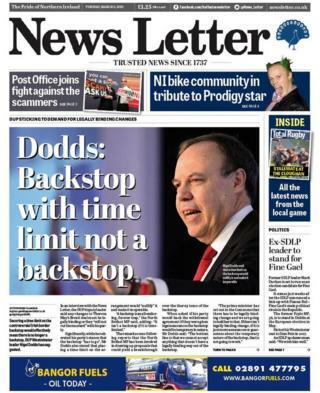 Mr Dodds told the newspaper that securing a time-limit on the Irish border backstop would effectively mean there is no longer a backstop. He said changes to Theresa May's Brexit deal must be legally binding or they "will not cut the mustard" with his party. The News Letter also reports that a once derelict castle in County Armagh is set to reopen after a £12m revamp. The Grade A listed Killeavy Castle, situated at the foot of Slieve Gullion, and its outbuildings have been transformed into a luxury hotel and spa. On the Belfast Telegraph's front page, DUP MP Ian Paisley vows to fight "grossly unfair" Renewable heat Incentive (RHI) scheme cuts. Mr Paisley made his comments after the Department for the Economy (DfE) proposed tariff cuts for boilers operating under the botched scheme. But the fuel actually cost far less than the subsidy they were receiving, effectively meaning that users could earn more money by burning more fuel. The Irish News leads with a story that claims political representatives from all parties may be excluded from the interview panel for PSNI Chief Constable George Hamilton's replacement, following confidential legal advice received by the Policing Board. The newspaper says that if the recommendations are adopted, it will be the first time that the appointment of the head of the PSNI will happen without official political input. Mr Hamilton, who was appointed chief constable in June 2014, informed the Policing Board of his intention to leave the service in June. 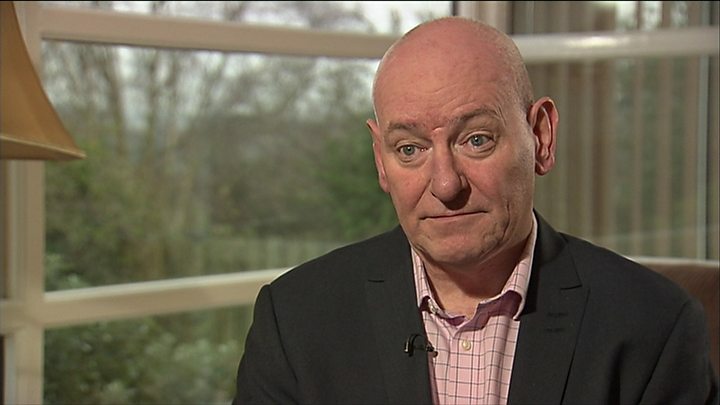 The newspapers all cover former SDLP leader Mark Durkan's plan to contest the European elections in May as a Fine Gael candidate. He will try to win a seat in the Dublin constituency. Mr Durkan, from Londonderry, previously served as an SDLP MP in Westminster until he lost the Foyle seat in 2017. Drug-related deaths among males in Northern Ireland have almost doubled in the last 10 years, according to new government figures, which are reported in all local newspapers. Statistics published by the Northern Ireland Statistics and Research Agency (NISRA) on Monday show 101 of 136 drug-related deaths in 2017 were males. The number of males dying from drug-related causes increased by 98% between 2007 and 2017. The Daily Mirror opted for the stark headline 'Dying for a hit' while the Irish News led with coroner Joe McCrisken's comments that up to seven prescription drugs are regularly being found in bodies during post-mortem examinations. Mr McCrisken said that cocktails of prescription drugs are being used to deadly effect.